When machining complex jobs such as die molds or complex engraving jobs which can take a long time to machine, power failure or broken tool means that you need to start the entire gcode file from start. Restarting the gcode file from start is very time and resource consuming. To be able to effectively restart your machining process from where you left, MASSO has a Resuming Program or Jump to Line feature (from software v3.30beta). With this feature the current gcode line number is saved into a high speed internal memory and if the machine is even powered off while machining, MASSO will automatically store that last line number in memory. Now press CTRL+J to open the Resuming Program window. 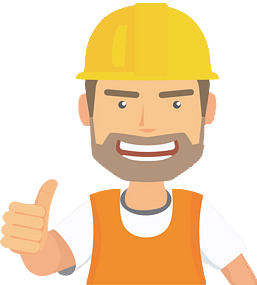 The last line number will automatically be filled and depending on your program, please go back a few line from the last running line so that the machining is resumed a few lines before it stopped. Calculate the X, Y and Z axis position to resume machining from. Cutting feedrate as per gcode. Carefully check the information and click the Run button. Move Z axis up to the homing position. Change tool if a different tool is required. Start spindle at the requested RPM and direction. 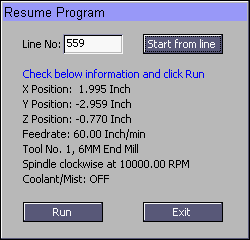 Start Coolant/Mist as per gcode. Goto X & Y resume position. Move Z axis down to the cutting position and start machining at the feedrate as per gcode file.